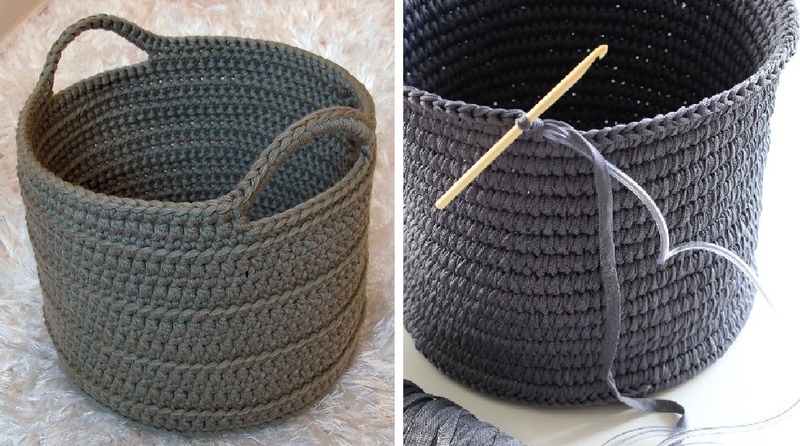 Crochet In Color (Elizabeth Pardue)’s free crochet basket pattern is a great place to start if you’ve never made a basket. There are dozens of uses for one (in the kitchen for utensils, in the bathroom for necessities, in the craft room for supplies, etc. ), and this pattern’s simple enough for everyone to try. You might also want to look at her other original patterns on Ravelry – there’s a lot of options to choose from, including more basket patterns. You’ll need the following supplies: a crochet hook (size “L”), 3 skeins of super bulky yarn (the pattern recommends Lion Brand Wool Ease Thick & Quick), scissors, and a tapestry needle. The pattern is crocheted from the bottom up, in the round as one piece, and the website includes both written directions and a photo tutorial. While you might be tempted to use a larger hook (after all, you are using larger yarn), resist the temptation. 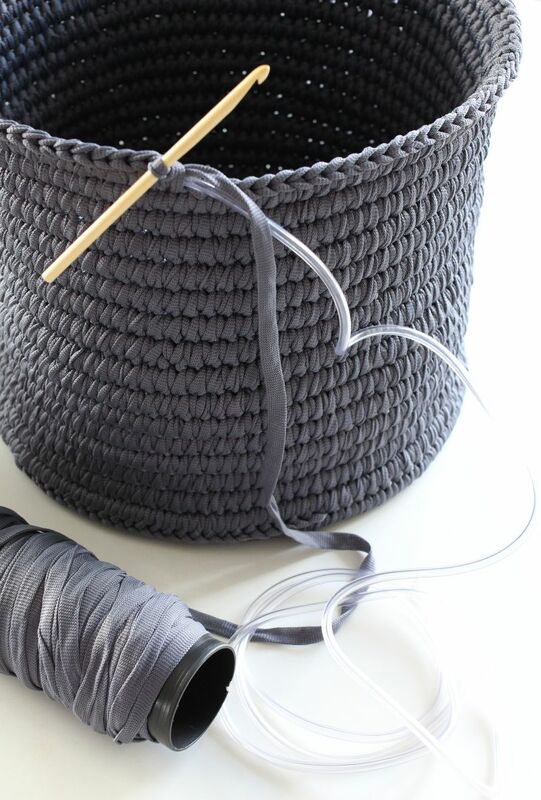 The smaller hook ensures that the stitch is stiff, which helps the basket retain its shape. Of course if you don’t want to use super bulky yarn, you can use a worsted weight yarn and up the strand count to four. This will produce the same effect, though the texture will vary slightly. You can of course use different materials as well, such as hemp, ribbon yarn wrapped around clear tubing, or t-shirt yarn. After you complete the basket, you can also add on finishing touches such as buttons, ribbon, or pom-poms. If you’ve been looking for a crochet basket pattern you can modify by using something like t-shirt yarn, ribbon yarn, or other alternative materials, you can try this free pattern at Ravelry – you do have to have an invite to Nurin Kurin (and you’ll most likely have to use Google Translate for help, though there are photos of the alternative “yarn” materials) in order to see those alterations, though there’s a great picture on Tumblr if you want a peek.